Not to be confused with Private law or Private member's bill. There are two types of private Act in the United Kingdom. The first are acts for the benefit of individuals (known as private or personal acts) which have historically often dealt with divorces or granting British nationality to foreigners, but in modern times are generally limited to authorising marriages which would otherwise not be legal. The second type are Acts for the benefit of organisations, or authorising major projects such as railways or canals, or granting extra powers to local authorities (known as local acts). 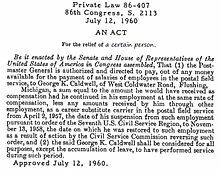 In the United States, private bills were previously common. Now federal agencies are able to deal with most of the issues that were previously dealt with under private bills as these agencies have been granted sufficient discretion by the United States Congress to deal with exceptions to the general legislative scheme of various laws. The kinds of private bills that are still introduced include grants of citizenship to individuals who are otherwise ineligible for normal visa processing; alleviation of tax liabilities; armed services decorations and veteran benefits. In some cases, where the recipient of a benefit of a private bill did not want it identified as such (especially in the case of tax relief), a public law would be proposed, but restricted to a certain class of persons usually identified by being in a specific location, having a specific kind of tax event, and occurring during a narrow window of time. For example, if Acme Corporation were incorporated in the (fictional) State of Winnemac on January 14, 1967, and wanted relief from a tax on the sale of a subsidiary in the City of Zenith for $18 million in stock, that occurred on April 5, 2012, their Member of Congress might write a statute declaring "such tax of the type shall not be imposed on any corporation chartered in the State of Winnemac after January 12, 1967 and on or before January 14, 1967 for an intrastate transaction involving a stock transfer of not less than $12 million nor more than $20 million which occurred after April 2, 2001 and on or before April 5, 2012." By making the terms of the law apply to only one organization it has the effect of a private law without actually naming the party to be granted relief. Private laws are published individually as slip laws and included chronologically in United States Statutes at Large. Slip laws and U.S. Statutes at Large are available in most academic libraries and Federal Depository Library Program institutions, and at the U.S. Government Publishing Office. ^ Davis, Christopher M. (August 10, 2018). Private Bills: Procedure in the House (PDF). Washington, DC: Congressional Research Service. Retrieved 4 September 2018.